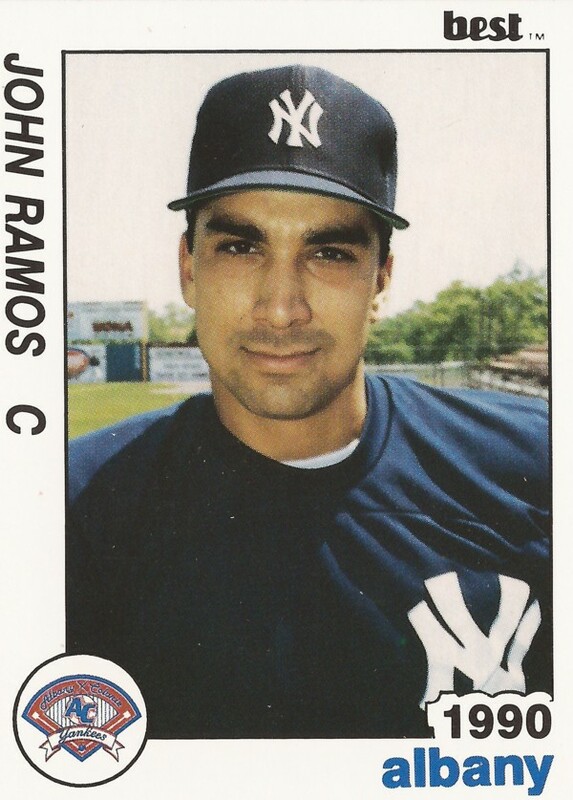 The 1991 season was coming to a close and so was John Ramos' first stint with the Yankees in the Bronx. "I expect to be here next year, and I'll be ready," Ramos told The New York Times. "The biggest adjustment will not be the one I make on the field, but feeling comfortable being a part of this team. I think that with each passing game, I'm feeling more and more a part of it all." For Ramos, though, those 10 major league games would turn out to be his only games in the majors. He would play five more seasons as a pro, but injuries would conspire to ensure he never made it back to the bigs. Ramos' professional career began in 1986, taken by the Yankees in the fifth round, out of Stanford University. He went to Stanford out of Plant High School in Tampa. Ramos played his first professional season between short-season Oneonta and single-A Fort Lauderdale. He hit single-A Prince William in 1987 and then got his first look at AA Albany in 1988. In the playoffs for Albany that September, Ramos made up for an early error, with three doubles and a triple, according to The Schenectady Gazette. He also knocked in four, helping the AA Yankees to the league championship. "They battled us and battled us, but we came through," Ramos teammate Jim Leyritz told The Gazette. "Johnny Ramos came up with a great game. He made an error, but the nice thing about this game is you can be a goat one minute and a hero the next. He didn't lose his confidence." Ramos returned to Albany for 1989, hitting .273 on the year, and again in 1990. In 1990, though, Ramos hit .314 over 84 games and got his first two-game look at AAA Columbus. In 1991, Ramos played the year at Columbus, hitting .308. He also earned that September call up to the Bronx. In his 10 games there, Ramos hit .308. Coming out of spring training 1992, Ramos was optimistic, according to The South Florida Sun-Sentinel. "I felt from the first day that I was going to make the team, and I still think I am," Ramos told The Sun-Sentinel. But he didn't make the team. And he also got into just 18 games at AAA Columbus, before an injury to his throwing arm ended his season early. Ramos came back for just 49 games at Columbus in 1993, then full seasons with the Padres and Blue Jays AAA Clubs through 1996, but he never made it back to the bigs. In 2003, Ramos was back home in Tampa, running his own marble company, Ramos Marble and Granite, according to The St. Petersburg Times. He also served as a youth baseball coach. "Everything is a blessing in disguise," Ramos told The Times about the end of his career. "I was ready for a normal family life."